Herbal Remedies for Dry Sinus- Plus Enter to WIN a Neti Pot! One of the first conditions I began formulating for as a budding herbalist was sinusitis. Having chronic hay fever myself, I found it only fitting to concoct some sort of super tincture in the hopes of wrangling in the misery and vanquishing it outright then and there. Oh how naïve I was! Nowadays I know for a fact that incessant sneezing can be stopped rather quickly with just a drop of lobelia, or better yet, avoided all together by incorporating stinging nettle into my daily meals. No need for that gazillion herb formula that could knock over a cart horse, no sir! Herbal preparations can be quite simple yet very effective and they certainly don’t need to be part of a 50 ingredient blend in order to work for most things, particularly sinus issues. As far as I’m concerned there are 3 main types of sinus troubles: runny, stuffy, and dry. For each of these types, there are certain herbs that will work better than others based on energetics; the effect that herbs have on the body like moistening, drying, warming, cooling, etc. So even though some herbs are “labeled” as “good for sinus trouble” it’s important to know if that herb is actually good for your TYPE of sinus problem. For instance, goldenseal is a popular herb for sinus issues. However, goldenseal is very drying so it would be terrible to give to someone with dry sinuses. Make sense? Good! The next thing to determine is the frequency of the sinus issue. Is it chronic (allllll the time), does it come and go, or is it acute (happens only when inhaling something especially bothersome like fumes or smoke)? Knowing this information with help determine which herbs to use and how long you will need to stick to an herbal regimen along with what life changes you may need to make in order to get well. Obviously, it wouldn’t hurt to avoid dairy and wheat to help move things along. Dry sinuses most often indicate heat. The tissues and mucus membranes will be dry, tight, and “stingy” feeling when breathing through the nose. There could also be nose bleeds and a feeling of dry obstructions in the sinus and often the eyes will be dry as well. Dry tissues and membranes need herbs that are moistening (demulcent), so adding a strong cold brewed tea to your treatment will do wonders. Sometimes these preparations can be rather mucilaginous so if it’s too much for you simply dilute the cold brew tea with an electrolytes drink or water. You can get all of these herbs here too! I recommend you use these herbs only as a cold brew tea as using them in tincture form will not work. Mucilage cannot be extracted in alcohol. Also, make sure you are eating plenty of healthy fats such as grass fed butter, coconut oil, ghee, and fresh salmon along with staying appropriately hydrated. Trust me, this will help! For chronic dry sinuses, diet change (get those healthy fats!) and hydration should be the first things you look into. Adding in cold brew teas made with the moistening herbs above will greatly improve symptoms. Use the teas as needed. For the coming and going type of dry sinus use the neti pot and the dry sinus oil. The cold brew teas of course will help and you can take them as needed. For acute dry sinus trouble use any of the methods I discuss in this article until the symptoms are gone. Acute situation usually need to be treated in an acute manner for best results. One of the best remedies for dry nostrils in particular is homemade sinus oil. If you don’t want to make it, you can buy it HERE. You should feel immediate relief! Now, for those brave enough to do this, there is another way you can use this oil…literally snorting a few drops of it up your nose. Yeah, sounds crazy, but this seriously gives the best and most lasting results. This method has been used in Ayurvedic medicine for thousands of years and is practically non-existent in western cultures. Needless to say, it sounds weird but works wonderfully! This is the method I often use as it’s an excellent way to treat dry sinus issues. You can either use a demulcent tea (violet works really nicely for this) or simply use the traditional saline solution. In either case, be sure to add your nasal salts or this won’t be very comfortable at all. When making a demulcent tea, make a strong cold infusion (using DISTILLED water) and then strain it very well. You don’t want plant particles up your nose do you? Next mix in the nasal salts and add the mixture to your neti pot. Once you’re done, blow your nose to expel any mucus and leftover saline solution. You should immediately feel a difference. This neti pot is made by my favorite sinus care company Baraka (and no, this is not a sponsored post). They make high quality ceramic neti pots as well as some pretty great nasal salts and oils. This is the neti pot you could win above. It comes with a sample size of Baraka nasal salts, enough for one use. I bought the dry nose oil and it didn’t work for me. I’ve also tried the saline rinses as well. What other options do you suggest? It sounds cliche, but staying properly hydrated helped a lot! Kindly let me know if oregano oil supplement is ok for dry sinusitis? I have been suffering from sinusitis since 2 months. I have pressure in nose,cheeks,ear ache and headache. I have taken antibiotics for 2 weeks but still have symptoms. Since there is no mucus I now realize its dry sinusitis. I recently started oregano oil since I was scared if I still have the infection but I am not sure if its a good idea. I would really appreciate if you can reply back to me. This has been an eye opener for me. As I am experiencing the hurtful side of sinusitis for the first time. Did not realise I had sinusitis until an MR-scan revealed it. All what you have written is a new world for me and I thank you very much for educating me on the subject. I am not a “pill-person”, so the herbal medicines is great. I am going to give it an earnest try. Best of luck Joy, I hope the remedies help! I’ve never used one before, but I need something to help with my allergies and my son’s. I don’t want to rely on over the counter meds so much. I currently have a cheap plastic neti pot and have been wanting a “real” one for quite a while and the one pictured is a beautiful blue. I am making the move to more natural healing and working on getting the chemicals out of the house so that my entire family can feel better. I want to win this for a friend! I already have one and love it. Great ideas…so going to try them out. 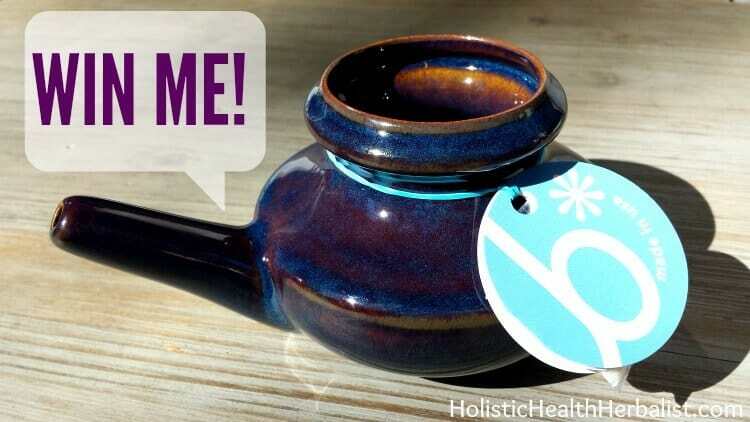 Can you include the essential oils in the neti pot? So glad I came across your blog. Great natural alternatives. Never used a neti pot but would love to try. My sinuses are not dry so I look forward to your future posts on other sinus ailments. I believe this neti pot would help my husband’s chronic sinus issues. I could sure use the sinus concoctions you’ve created. Been fighting bronchitis and sinus infection now for about three weeks. First week I saw the doctor and she gave me meds. I was on the mend the second week. Third week I have it again. Ridiculous. Stay tuned as I’m writing a couple more posts on specific sinus ailments. I’m sure that there will be something useful for you =) Meds never worked for me either, but herbs always do!